The last man to leave his bootprints on the moon will pay tribute to the first man who laid foot there at a national memorial service for the late astronaut Neil Armstrong. Eugene Cernan, who followed in Armstrong's 'small steps' as the 12th and last American astronaut to stand on the lunar surface, will join NASA Administrator Charles Bolden and the former Secretary of the Treasury John W. Snow at the Washington National Cathedral on Thursday (Sept. 13) to deliver remarks celebrating Neil Armstrong, commander of the Apollo 11 mission. Thursday's public memorial in Washington, D.C., precedes Armstrong's burial at sea, to be conducted by the Navy on Friday. Details of his ocean interment were not released, though President Barack Obama ordered flags be flown at half-mast to mark the day of the ceremony. 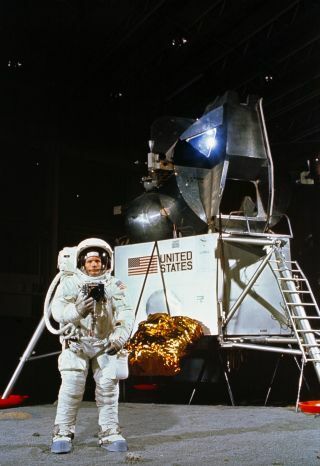 Armstrong's Apollo 11 crewmate, Michael Collins, will lead the assembly in prayers. In July 1974, Collins, Neil Armstrong and Buzz Aldrin donated one of the moon rocks they brought back to Earth to the National Cathedral. A sliver of that same lunar rock is now on display there, embedded in a stained glass window that pays tribute to their historic moon landing. In between the tributes and readings, the latter to include a biblical passage read by former Secretary of the Navy John Dalton, musicians will dedicate performances to the late Armstrong. Canadian jazz pianist Diana Krall will sing "Fly Me to the Moon" as arranged by Frank Sinatra. The Metropolitan Opera Brass, the U.S. Navy Band "Sea Chanters," and the Cathedral Choristers will also perform pieces, including "America the Beautiful." The ceremony will close with Bolden's presentation of an American flag to Carol Armstrong, the astronaut's widow. The U.S. flag was flown over the Mission Control Center at NASA's Johnson Space Center in Houston on the day of Armstrong's passing. For those unable to be there, NASA will air the memorial service live on its television channel as well as stream it online through its website.